If benzene had three double bonds, three sides of its ring would be shorter than the other three sides. 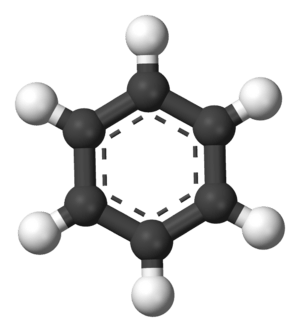 X-ray diffraction shows that all of six carbon-carbon bonds in benzene are of the same length of 140 picometres (pm). The C–C bond lengths are greater than a double bond (135 pm) but shorter than a single bond (147 pm).. One representation is that the structure exists as a superposition of so-called resonance structures, rather than either form individually. (In other words, the molecule's double bonds switch quickly between pairs of carbon atoms.) The delocalization of electrons is one explanation for the thermodynamic stability of benzene and related aromatic compounds. It is likely that this stability contributes to the peculiar molecular and chemical properties known as aromaticity. 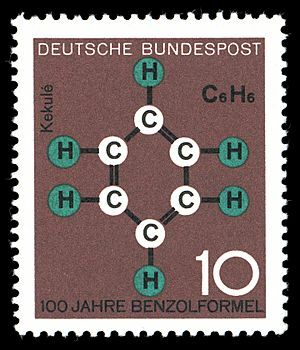 To indicate the delocalized nature of the bonding, benzene is often depicted with a circle inside a hexagonal arrangement of carbon atoms. Benzene Facts for Kids. Kiddle Encyclopedia.